Need a secure way to hold a swinging door in one place while you MORTISE it or INSTALL HARDWARE on it ? Here is IT IS !! JAMM is the DOOR WEDGE YOU PLACE UNDER THE DOOR EDGE !! It works on ALL FLOOR surfaces . 2 SIZES AVAILABLE. 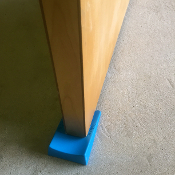 Get the REGULAR JAMM for doors with up to 7/8" gap at bottom AND get the JUMBO JAMM for doors with 1/2" gap to 1-3/8" ……...AWESOME Door Wedge for the Door and Hardware Installer. It can DEFINITELY handle the PRESSURE ! Get 1 for $19.95 or get TWO for $30 !! Get One of EACH ! !